What is an Odorous House Ant? Odorous House Ants – commonly referred to as “Sugar Ants” – are tiny, 1/16th – 1/8th inch long and blackish-brown. Odorous House Ants get their name from the stench they produce when squished. Many people report smelling a rotten coconut or a rancid butter smell. Odorous House Ants feed on dead insects and sugary substances and tend to be seen in kitchens, bathrooms, and cupboards or anywhere food crumbs or food residue may be found. They commonly nest in or around houses, many times in the wall voids, making their nests difficult to find. If you are seeing Odorous House Ants in your home, they most likely have at least one nest in or around the home. The length of time you’ve had the problem will determine how many nests there could actually be. An important thing to know about these pesky little ants, is that they are “budding ants” which means that they will decide to split up the nest whenever they feel like it and start a new colony in another location. The typical time frame for nest to stay in one location is 22 days. 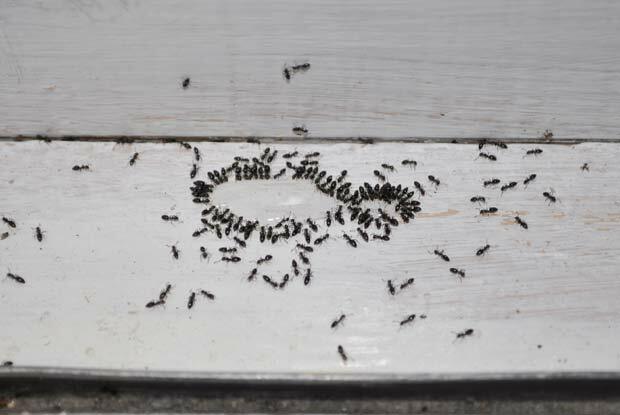 Typically, a home that has been infested by Odorous House Ants once will be re-infested by them again and again, unless their food, water, and shelter sources are removed. Portland Pest Guard will use Integrated Pest Management (IPM) for Odorous House Ants, meaning the service specialist will be providing a thorough inspection as well as seasonal inspection around the home or business to make sure the ants don’t come back. The specialist will also use preventative methods whenever possible to seal up cracks and crevices where the ants are getting in. He or she will also treat at the source of each nest to target the queen. It is normal after the first treatment of Odorous House Ants to see an influx of activity. You may think your problem is getting worse but it is actually getting much better. A follow up or two is almost always required to get the ants under control and manageable for the seasons to come. Give us a call today at 503.720.8559 to learn more about Odorous House Ants or to schedule an inspection!